On behalf of the team and all the developers who contributed to this build, I am proud to announce the release of Cinnamon 2.8! 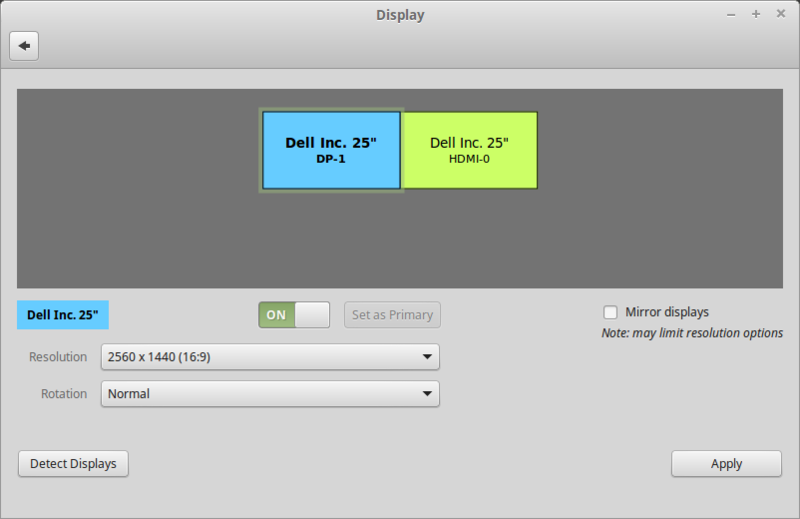 This new version will be featured in Linux Mint 17.3 “Rosa” planned for the end of November and in LMDE 2 “Betsy”. Have a lot of fun with this new release and don’t hesitate to give us some feedback! Enjoy. Here’s a quick overview of some of the new things in Cinnamon 2.8.
great release, a lot of details I’ve been waiting and hoping to see in Cinnamon for awhile. I hope little bits of polish will continue with each release. these things make using Cinnamon even more enjoyable and awesome. hi clem lookds good. i recently installed ubuntu 15.10 (cos i wanted newer packages) with cinnamon on top, unity removed. how do i install cinnamon 2.8? will it show up in the ubuntu backports, or can you provide a command something like ‘cd /tmp; wget http://url/package1.deb http://url/package2.deb; sudo dpkg -i *.deb’ ? You can probably use Gwendal’s PPA. Careful though, they’re Mint packages (they should be largely compatible with Ubuntu but you might have to tweak a few things… systemd settings for instance, if you’re using non-LTS versions of Ubuntu). Greetings guys and thank you all your hard work!!! Cinnamon getting better and better!!! Clem can you look after the Linux kernel 4.3 for LMDE 2? It gives much better support for Skylake CPU and newest GPU`s for both Nvidia/AMD!!! ( It can help a lot for my friend and others, some has issue on forum too!) Or do everyone has too wait for another ~1 1/5 year for LMDE 3?! Kernel 4.2 has been backported for Jessie. Therefore 4.3 may be backported in a few weeks by the Debian team. Watch Jessie-backports repos. Absolutely! That is main reason why i can use linux at all. Thanks to LM Cinnamon. HI! I have a problem with my LM Rafaela (Portuguese edition): on the lower bar, the date displays properly (“Segunda” stands for “Segunda feira”, wich means monday. But on the calendar above it, it’s showing “Dom”, abbreviation of “Domingo”, wich means Sunday. Any idea how to correct this? I’m using 2.8 via the Romeo repos. 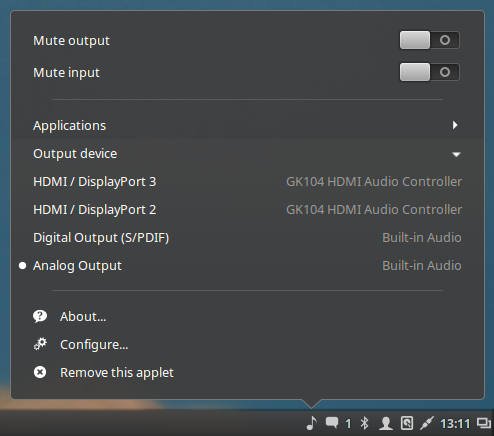 I can see the visual update to the sound applet, however the right click menu doesn’t show output devices and apps as yours does – it just appears the same as the previous version. I have indicators enabled in settings. You only see “Applications” if an app using the applet is running (like banshee). To see all the devices, I click on “Output Device” and I have the same result as Clem picture. Could you please post a picture of what you see? Hi. How do you go from Cinnamon 2.6 to 2.8? I am an extreme newbie and the whole process confuses me. If you’re using Mint wait for the upgrade to version 17.3 (Cinnamon 2.8 will be part of that). If you’re using LMDE, it should make its way to your update manager any day now. This truly looks awesome. Thanks to all contributors for your hard work. It really surprises me how Cinnamon became the (in my opinion) best looking and most user friendly Linux desktop in such a short time. Keep it up! I don’t believe you will see “Output Devices” either unless more that one is available. Thanks, Clem and gang. The quick rename feature is a very welcome improvement to Nemo for me. I rename files a lot. Thanks a million. Can’t wait to try it out in LM 17.3. How about bulk rename, i.e. renaming a bunch of files in one go? Is it in the pipeline? They have this in Windows and it can be very helpful sometimes when you want to rename a list of related files. Renaming them one by one can be very tedious. Anyway thanks again for all the hard work that goes into improving Cinnamon. Great job ! Clem and the entire Mint team, keep up the good work. I’d like to install Cinnamon 2.8 in my Notebook. How Could i do this? I’m using Linux Mint 17.2 and Cinnamon 2.6.13. Hi Fernando, you can enable Romeo (see the previous post) or wait for Mint 17.3 and upgrade to it. does the new version brings mandatory roundness for selected icons and text? Hi, I’m not sure what you mean. Nothing is changed in regards to roundness..
Great work! Any news on fixing this Nemo issue? It’s quite a blocker for using Nemo as a daily driver in larger file manipulation presently, as move/copy ops are occasionally unreliable. Hi Seb, I think that’s an underlying issue in gvfs. We’re planning to review our use of gvfs but that didn’t land in 2.8. I run both Nemo and Nautilus on an Arch GNOME 3 desktop. Nemo will always freeze when copying files especially from media such as a phone or USB stick or over the net. Nautilus does not have this problem. I use Nemo as my daily driver and it also displays desktop icons under GNOME3 but if I need to copy a lot of files over the network or from a USB device I always drop into Nautilus or use MC. Would love to see this bug fixed. BTW I run Mint 17.2 and Cinnamon on my laptop…Love it. Thanks for your work. Great work, we apreciate ! Can we install this stable version on our LM17.2? Maybe using the same method as for “Early access to Cinnamon 2.8”? There is a post above which hints this is what we need to do, but I want to make sure, thank you. Yes. Officially there’s a month gap between the releases of Cinnamon and Linux Mint, precisely to make sure you get it after we fixed as many bugs as possible (you can see the minor revision of Cinnamon 2.6 is 13 for instance… it had time to mature). It’s already pretty stable though.. so if you can’t wait for 17.3, you can enable Romeo and access Cinnamon 2.8 that way. But why do you still have these weird brackets in buttons of the window titles in the panel? The button is visible itself, so why don’t you remove it to have just Home and Documents written on a button without “[…]”? It happened with qmmp, a Firefox “app” and with pidgin windows (these are the windows I usually want to access at any workspace…). Now that I read this, I noticed it may have something to do with the window name change. ?? I’m waiting for Linux Mint 17.4 «Arch», Linux Mint 18.0 «Ubuntu», Rosa Linux 2016 «Mint». rename in nemo 2.8.1 with slow doubleclick doesn’t work for me, even after a reboot. Setting is activated. I use a touchpad. I use mouse and it does not work for me either. First I installed cinnamon 2.8.x on ubuntu server and it worked there, then i upgraded it on may laptop and there it doesn’t. For me it works in Icon and Compact views, but not in List view. Hope this got resolved till 17.3. It won’t. It was a known issue holding the feature from getting merged. We let it in, although it was incomplete, because it was popular and a lot of people were asking for it to get in on github. Doesn’t seem to work in list view. Hi, I think it only works in icon view. Hello and thank you for a new Cinnamon, after install 2.8.2 it seems like my fans are running full on all the time, apart from booting to bios, what app can i check fans with? thank you. I only have one problem with Cinnamon: the fact that for reasons that I don’t know it doesn’t work good in other distributions so they don’t include it in their default repositories. It would be great if you could fix whatever is that the people from those distributions don’t like. For various reasons I have to use more than one distribution and I would like to be able to run Cinnamon easy in all of them with official support. You might also attract more contributors to the project this way. Since they seem to like MATE I don’t think that they have any problem with the people behind Linux Mint, I assume that it’s something technical and I don’t know exactly what that is (I heard that there are incompatibilities between the libraries/applications used by Cinnamon and those used by other applications, or something like that). Cinnamon is available in most distributions. Which one are you using? PS: I removed the off-topic bit. Just after posting the previous message Fedora 23 was released which finally has a Cinnamon spin so it seems that the problems are already solved and my comment is no longer necessary. OpenSUSE still doesn’t have it but if Fedora could do it this means they should be able to do it too. 2) Windows previews are nice but they are too small (not sure if this is only on HiDPI) – is there a way to make them bigger? 4) When HiDPI is off, logging in for the first time after comp startup happens within 1-3 seconds. With HiDPI it takes a clear 5-10 seconds. Is there a way to speed this up? Big Thanks for this little but really missed feature! 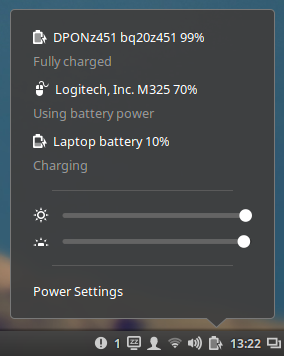 Guys is there any way to add my wireless mouse battery info to show in power applet? I can see that this (or some similar hardware related) info is available in screen shot in article but it does not seems to work for me. Mouse is ZALMAN ZM-M520W. Type “upower –dump” (with two – signs). See if the model/brand appears in there. Thanks for reply anyway Clem. 1. )It’s nice that you have included the quick rename feature, BUT why do you hesitate to include a “recent folders” menu item below the “recent files” menu item? 2.) Is there a silverlight substitute in LM 17.3 now? 3.) Is the mouse click speed reduced again, to avoid issues regarding single click action, where the system treats it as a double click because the mouse click speed is set to “slow” a bit too much? 4. )will edge-snapping be included again, like it was in LM16, where it was introduced? 4) What do you mean? If you’re talking about snapping/tiling for windows, it never went anywhere. After quick test, one tiny issue noticed: “System Settings” -> “Input Method”, and “System Settings” -> “Languages”, both open “Language Settings” window on the same tab, I imagine the former should jump straight to the “Input method” tab? Really enjoying the NVIDIA Muffin patch (no lock-ups while using Optimus), thanks again Michael Webster! That’s pending an update to mintlocale. Thank you Mint team. LMDE runs perfectly. Are we going to get an improved installer and a drivers app too? Not that i am not happy as i am. That’s a bit off-topic… a few bug fixes landed in the installer already. No news on the drivers front. Congratulations Clem and the development team! how to add commend right- click send files with bluetooth in nemo? Cinnamon 2.8 still doesn’t show shadows under desklets text unless I hover the mouse over them, this makes the text difficult to read with some wallpapers, like the default one. I think this problem started with the version 2.4, Cinnamon 2.2 was working fine. 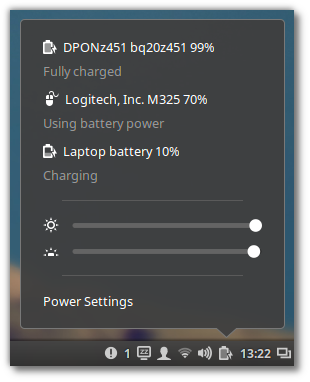 The labels like “Fully charged” and “Using battery power” on the Power applet are above or below the referenced devices? I am not sure if it is implemenmted but a close x icon to close the window is available in Window thumbnail view as well. I understand the part about status icons vs indicator icons. I like indicator icons but it seems that many are missing and forces me to switch back to status icons. So my question is: am I right or is it just me who doesn’t know how to install indicators? I’m talking for example of Skype and Owncloud client. Are there indicators for them or only status icons? Excellent work! Usability tweaks and enhancements can make a great difference to how something feels. I noticed a minor bug in the slow doubleclick rename feature in Nemo. If I click a file, click away from the file (ie click an empty area in the Nemo window to deselect the file) then click the same file again this seems to be detected as a slow doubleclick and we go instantly to renaming. This seems incorrect and inconsistent. On the plus side, the double click to rename is much nicer than in Windows which introduces a ~1s delay between the second click and the text becoming editable – just long enough to make you think your click didn’t register and re-click. Hi, when exactly is this update expected to arrive on LMDE? Very very soon. It could land today, tomorrow, it’s only a matter of days now. Hi guys, I don’t know this is cinnamon-related or just a problem within Firefox but when I downloaded something and want to go directly to the folder where the file is stored, the system freezes. All I can do is ctrl-alt-backspace. Maybe this is posted in the wrong place but I though I’d let you know. found another Bug – a Desktop Bug – if i accidently hit on the cinnamon Desktop STRG-F und Hit Enter (with or without a search term) – the Desktop crashes btw. the icons on the Desktop are gone. If i mark serveral Files with Shift und Mouseclick and try to move them – same as above – icons are gone from the Desktop and i need to restart the cinnamon desktop. I can’t reproduce the 2nd issue.. for the 1st one, I can’t reproduce the crash, but I can see the nemo search on the desktop itself, we’ll fix that. I also have this issue, to reproduce: Enable quick rename, click on a file (or folder) then hold Ctrl (or Shift) and click on another item, then click again on the first selected file/folder; nemo will crash. I ment the 2nd one! Is there a mirror somewhere that already has Cinnamon 2.8? I cannot find it. Thanks. Thanks for your great job !! I hope this is relevant, if not please file under “irrelevant” – i.e. delete! I have enabled “Unstable packages (romeo)” in the Software Sources in two of my laptop devices. whereas under Cinnamon 2.8.2 Desktop, only the latter is showing. Maybe this is expected, and there are additional steps to take in Cinnamon 2.8.2 Desktop, i don’t know, just thought I would raise it. I think you need network-manager-openvpn-gnome also. i notice that typing in the first few letters of a program in the search box can give spurious suggestions (this time it happens in both devices). After typing “s”, i get “AcceSSibility”,”Account detailS”, “AppletS”, so everything going well but under the first three suggestions, I’m getting others like “Audacity”, “Avidemux(GTK+)”,”Bluetooth”, “Calculator” which have no letter “s”. Inputting the second letter “o” brings up “Display”,”GDebi Package Installer”, “Synaptic Package Manager”, none of which have both an “s” and an “o”. I haven’t actually looked at how the menu search function works but I believe it searches on other criteria besides just the application name. If you take for example typing “so”. The comment line in the GDebi desktop file is “Install and view software packages”. GDebi will also come up if you type “view”. Btw, idk if there is an option for what i will ask but..
Is it possible to show a notification with a button to open update manager whenever a new update is available? i think that would be a simple but nice feature because there are some users that never give proper attention to updates. As mentioned by Joe, I’m also missing a ‘recent folder’ list in nemo. If I use the ‘export as PDF’ feature of Libreoffice this PDF doesn’t appear in the ‘recent files’ list. Is this a topic of nemo or of Libreoffice? If it can’t be fixed easily the ‘recent folder’ list would be a good work-around. Thanks Clem, installing network-manager-openvpn-gnome worked for me. Thanks JosephM, I didn’t think that the search engine was that granular. Are there any plans to revise some icons? For example, the icons for “Desktop” and “Files” sitting on my taskbar are quite similar – could the “desktop” look more like a screen icons (akin to the icon for Applets in System Settings) to differentiate it more? Also, on the Mint Menu, the icons for “Files” and “Places” are very similar. To differential them, could we change the “Places” icon to look like the icon for “Home” in Nemo, after all they refer to many of the same folders (many that’s just because of my setup). Upgrading to Cinnamon 2.8 went smoothly on my amd64 LMDE but I am now left with no background/wallpaper. The Icons and Panels are intact but the background is black! I’ve restarted Cinnamon, restarted X , logged out and rebooted. with no success. I note from the blogs that this has been an issue in the past but have not seen a work around or solution. Is this issue known and being addressed ? No.. and do you have the ability to set a wallpaper? 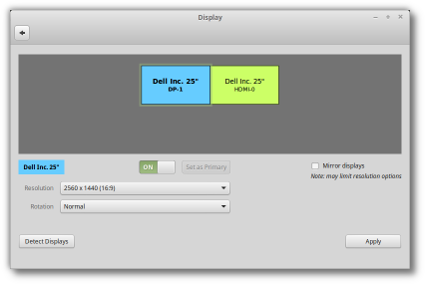 @Clem – I can select a wallpaper from the selection dialog and the wallpaper shows as selected. but no wallpaper becomes visible on my desktop. Is it just me or are the shortcut hotkeys messed up? Ctrl+Alt+L used to lock my screen. Now it opens “yelp” which seems to be a help browser. In the keyboard shortcut it still is listed to lock the screen. Under launchers there a help browser with no associated shortcut. Changing this shortcut to Ctrl+Alt+L now opens the terminal. So I think all commands are wrong. Any chance to fix that? When i working on terminal (for example: updating apps) or evolution email client (for example: writing new emails in new window), see a black screen. Please, fix this problem when is possible. Another minor thing: Sometimes when I go fullscreen on youtube it still shows the workspace hint (Workspace 2). It can only be removed by leaving fullscreen mode and hover over the workspace icon. I guess it’s because the maximize/minimize icon of the youtube player is in the same place so the hint activates but doesn’t deactivate anymore. I use 2 panels (top/bottom) and the workspace switcher (2 workspaces) is in the bottom right corner. In the corner it’s workspace 1, workspace 2 then trashbin applet (order: left to right). Any quick fix other than removing the switcher? Like deactivating the hint for the applet. I meant when you leave fullscreen. If you hover over the minimize icon for a bit then click it then the hint appears and stays even if you don’t hover over the workspace icon. Cinnamon 2.8 is very unstable with my current settings, it keeps freezing all the time. I know this is due to my settings because Cinnamon works perfectly with a newly created user account. How can I go back to Cinnamon 2.6 or restore Cinnamon 2.8 to default settings? Thanks, unfortunately it didn’t work. Cinnamon ALWAYS freezes if I run Nemo just after running Mint Update, sometimes showing artifacts on the screen. I will try removing some other settings files. Nevermind, I have updated Cinnamon to version 2.8.3 and no more freezes with my previous user account. I was wrong, Cinnamon 2.8.3 is still freezing. I will have to restore my user account completely. After throwing on Spotify, sound was playing out of my computer speakers instead of my headphones. I thought it would be a frustrating issue, but to my surprise it was extraordinarily easy to fix in the sound bar. It even showed the Spotify album art! Mint looks absolutely beautiful and I look forward to continuing to use it. Thank you all for your hard work. Looks like there’s something different other then in the applet. please use a high end kernel in 17.3 ….. only kernels as of 3.19.0 work with my ‘toshiba A215-S4697’ …. i would very much appreciate it …. and thanks …. !! 4.2 was ruled out today but 3.19 looks like a keeper. The only remaining obstacle is to make virtualbox work with it, we’re working on it right now. First off, great job with 2.8! I’ve been test driving it, and it feels great. Now for question: do you guys have any plans on giving easy access to overscan settings in the Cinnamon screen resolutions settings? I’m a Intel integrated user, and unfortunately have no easy way to configure my laptop when I connect it to a TV. The only way to do it (since there are no Intel driver management programs) is to mess around with xrandr and such, a task I don’t feel up to every time I connect to a TV. Once again, thanks for your hard work! Alt+F2 –> push enter and Nemo will open. Is this on purpose or is it a bug? I would expect it to do nothing since no command is typed. Maybe it’s just me, but the change volume sound stopped working. I suspect it happened at the cinnamon 2.8.3+rosa upgrade. I can confirm this. Same problem continues to be present in cinnamon 2.8.4. In fact, in “System Settings > Sound > Sound Effects” nothing seems to work anymore in 2.8.4. Everything was fine in 2.8.2. Hi clem! I have another problem. Suspend button missing in a menu. Suspend command from terminal does not work. I have an issue with brightness control. After shutting down the screen, the brightness stays at minimal level, although brightness indicator in tray shows full brightness. After changing the level of brightness, it comes normal. Very nice job thank you very much! Hi Ludo, check the 3rd party applets (System Settings -> Applets -> Get more online). I think there are alternative clock applets out there which support this feature already. is in the future possible to have in cinnamon something like xfce compositor? Say the first time I open a context menu in a nemo window, its for a .dia diagramm file that would be opened with DIA as a default. Afterwards, for every file it will say “Open with DIA” in the first line of the context menu, even if it is a text, a spreadsheet or whatever. The icon shown is the appropriate one for the default application to open the file with, and the right application is actually used for opening. Only the text refers to the false app. Depending on what file I first open the context menu for, the text is stuck on its default application name. This happens for every new nemo window, but not for desktop files, where only the word “Open” is shown. Not pretty sure if it is proper to talk about IME here. Just some recommendations about IME user experience. Currently IME needs to be installed manually after system installation. It will be more handy if IME selection is added to system installation procedures. Another thing is about ibus. After installing ibus, the ibus button shows that there are 50 components to be installed. But clicking on the ibus button will install all 50 components without showing a list to let users choose what they want. Too many installed components will make switching between traditional Chinese input and English input difficult. However, there is no simple button to remove installed components. And using “sudo apt-get purge ibus” can only remove 47 of them. Sadly the remaining 3 components are the components I want to remove. So eventually I re-installed the system and installed the only component I need through commend line. I will recommend to add a list for ibus components and a simple way to remove installed components. Hopefully these can be improved later (maybe 18?) and I am really happy to see Linux Mint getting better and better. Thank you for your awesome project! I am on Arch Linux and have noticed they have not pushed Cinnamon 2.8 to repos, it is not even in testing repo and have been marked as “out of date” for almost a month now. In reddit I found a workaround using manjaro’s testing repo but I do not feel comfortable using this third-party packages. If anyone can provide information about this or is in a better possition to figure out what is happening with cinnamon packages I’d really appreciate the help. Guys, can you add Global menu indicator and window buttons on pannel indicator, for users who love Unity style? And removing of maximized window decorations. I very useful for small netbooks with 10″ screen. is there any chance for xorg 17 and libreoffice 5 in LMDE2 Betsy ? There are memory leaks. Memory usage of process cinnamon starts to grow. It’s about 500 MB after 4 hours of work. I am LOVING this release (using fedora 23). Thank you to everyone who worked on it. I used to do work on gnome (years ago). You are inspiring me to think about working on Cinnamon! Nice work, thanks! It’s a big release, lots of bug fixes and nice improvements & new features. Like it! seems that memory leaks realy exists in 2.8 release. so, Cinnamon uses about 2Gb. Can I help in investigation of the root cause of a problem? Clem, can you add “Recent apps” and “Recent files” to the Cinnamon Menu? Thanks to everyone involved with this release. So far it has been fantastic. Tested and used actively on a laptop and desktop computer. The various 2.8 improvements/features implemented that I’ve used so far have worked well. uptime is 24hours now, and seems that all is OK with memory. I removed Weather indicator applet from panel, maybe it is the source of memory leaks but I doubt. Awesome! Cinnamon 2.8 is the most polished Linux desktop. In mate, I just use an XML file. In older versions, I would use an option to look up folders recursively. A third option would be to allow Cinnamon to use symbolic links and put those in folder. But, that didn’t work either. Cinnamon 2.7 (Mint 17.2) Crashes quite often, if using KONQUEROR as you file manager. Cinnamon 2.7 also does not invoke the default file manager (If other than Nemo) when you open “COMPUTER” and click the current default file manager displayed in top of computer list (In my case Konqueror). It unconditionally invokes Nemo? Hi, I am trying to get a better overview over the available DEs for Linux. I would like to know the dependencies of each Cinnamon release. While you are at it, maybe help people better see the differences between the DE designs, e.g. 17.3 (Rosa) cinnamon crashes to fall back with recommended nvidia 304.131 driver using kernel 3.19. Not crashing with nouveau…but proprietary driver is necessary for games to be at all playable with nvidia GeForce 7300 GT card. Cinnamon uses much memory and is laggy. Is there a fix for this? The problem was absent in 17.2, but was looking forward to a crisper performance in 17.3. Am using Centos, have been on build 1503, updated to 1511 (7.2) earlier this week, Cinnamon updated at same time 2.8.5. Overall looks great but… Desktop now broken. No icons displayed (I’ve double-checked enabled in settings), no right-click functionality (right-click works in task bar and titlebars). I’ve created directories and files directly in Desktop from Nemo (using Desktop and a normal directory) and that works fine when viewing as a directory but content is not shown when viewed as Desktop. your new release cinnamon 2.8 is very good,but the gap between the icons on the bottom panel to wide on menu side. adjustable or tell me how thank you! Hi, Just installed 17.3 on a dell inspiron 531 (AMD 64), And machine kept freezing up until I changed the video drivers to the recommended nvidia drivers, Now the machine doesn’t freeze up, but Cinnamon always crashes. I can still use it, but only on fallback screen. and have to work around things to get my home page. Any fixes for this problem ? otherwise just love this OS. * Please consider the possibility of editing the menu panel so it can fit in the horizontal side of our screen. I would like to have my panel on the left side of my monitor instead on bottom or top. These two features added will make great impact for users when using cinnamon, and this impact will be a good one. You can download Grub customizer to provide a tool to edit GRUB and aspects of it via a GUI. Cinnamon 2.8 included in LinuxMint 17.3 is great but I still want to suggest and add some missing. maybe detecting script is doing wrong? Just loving Linux Mint 17.2 Cinnamon; wondering why I kept messing with Windows XP on a 2006 desktop too good to trash but not eligible for Windows 10, Microsoft’s answer to Big Brother. FWIW, nothing seems to get the sound working, either onboard or PCI Card (Soundblaster Audigy). Wondering whether the upgrade to 17.3 will fix this although I believe that the kernel remains unchanged if 17.2 is already installed? 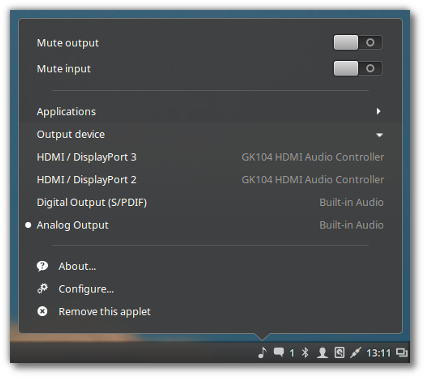 Luckily 99% of what I do does not require audio – not on this machine at any rate – but it would be great, for a relative newcomer to Linux, to be able to manage audio and video seamlessly, one thing that Windows did do well. Some years ago I left both Gnome and Ubuntu because I didn’t like Gnome 3 or Unity. For a while I used both XFCE and Cinnamon (such as it was at the time). When MATE became mature enough to be usable I switched to it, and stayed with it since. But recently I got curious what Cinnamon had turned into, and decided to try it again. Wow, what a difference from what I remember. I’m using Debian Stretch with Cinnamon 2.8.6, from their repos. It’s smooth, fast, stable, highly configurable, and full-featured. It’s suddenly my favorite DE. What an achievement for a project that started out as just an attempt to make Gnome 3 usable. Kudos. I’m having trouble with the System Settings. Every time I open the Backgrounds Module, I get Segmentation fault. Is there any way of fix this? Can you run cinnamon-settings from a terminal and see if there are any error messages when you open backgrounds? I’ve noticed that if using indicators a second Skype instance run with “skype –secondary” doesn’t get an indicator and if you close it you can’t access it anymore. I guess not many people use two Skype instances at the same time but in my case it is work related so this forced me two switch off indicators. @Clem has anyone reported this yet? Out of most of the popular Distro’s of Linux, I have found that Linux Mint 17.3 “rosa” is the only one that I didn’t have any problems loading on my MacBook Pro late 2011 8,2 v 10.11.3. As a die hard Windows user for many years (v 2.1 – Win 7) I switched to a Mac, took me 5 years of not only hating Windows, but I hate the Mac almost as much, I am now Linux Mint only, of course I have to keep the OSX just for updates and whatnot. Thanks for the great OS. much but the increasing memory usage issue is irritating along with the startup hours until noticeably slow and has me press ctrl+alt+esc to relieve the situation. I would like a solution to fix that issue. I respect the endeavour of linux mint distro developers and I will always support their priceless dedication to their work. Kudos to them! Great work, Simply love it !! Cinnamon in all releases of mint 17.0->17.3 has a BUG. When the home button is clicked nemio is unconditionally invoked as the file manager ignoring the current default file manager when it is NOT nemo. Anybody have a fix/workaround for this to invoke correct default file manager without having to change nemo a link to the default manager. I know this works but you loose desktop management of icons. I see lot’s of great stuff in cinnamon, but also some lousy stuff. IE nemo default file manager is the slowest file manager and least friendly of all Linux file managers. I happen to use Dolphin but have also used pcmanfm, spacefm etc. Dolphin has thumb nails shown on folders when a jpg or png exists in the folder adding to ease of identity(a trivial but user friendly touch). A Big issue is Dolphin displays files 1,000 times faster than nemo when directories contain hundreds or 1,000’s of files. This is also true for spacefm and pcmanfm file managers (just as fast as Dolphin vs nemo). Nemo takes minuets to start the display of large directories (perhaps a poor sorting algorithm). Both Home and Computer button click event on the desktop invoking nemo is fine, but all subsequent clicks ignore the Default file manager and continue to use nemo?